MAITLAND, a surname of Norman origin, in early times written Matulant, Mautalent, or Matalan. Nisbet, in mentioning the name. (Heraldry, vol. i. p. 292,) adds, quasi mutilatus in Bello, as if it had been first given to one maimed or mutilated in war. There can be no doubt that among the followers of William the Conqueror when he came into England, was one bearing this name, whatever may have been its derivation. The first on record in Scotland was Thomas de Matulant, of Anglo-Norman lineage, the ancestor of the noble family of Lauderdale. He flourished in the reign of William the Lion, and died in 1228. The early history of the family, like that of most of the Anglo-Norman incomers, relates chiefly to the acquirement of lands and donations to some particular abbey or religious house, for they were all great benefactors to the church, and the ‘Matulants’ formed no exception. Like many Anglo-Norman and Anglo-Saxon families, they settled in Berwickshire. Thomas’ son, William de Matulant, was witness to several of the charters of King Alexander II., which proves that he must have been much about the court of that monarch. He died about 1250, leaving a son, Sir Richard Matulant, who, in the reign of Alexander III., was one of the most considerable barons in Scotland, being the owner of the lands and baronies of Thirlestane, Blythe, Tollus, Hedderwick, and other properties, all in the shire of Berwick. To Dryburgh abbey, which had been founded little more than a century before, he gifted several lands, “for the welfare of his soul, and the souls of Avicia his wife, his predecessors and successors.” His son, William de Mautlant of Thirlestane, confirmed these gifts. He was one of the patriots who joined King Robert the Bruce as soon as he began to assert his right to the crown, and died about 1315. The son of this baron, Sir Robert Maitland, possessed the lands of Thirlestane in his father’s lifetime. Among other charters he had one of the lands of Lethington from Sir John Gifford of Yester, confirmed by King David II., 17th October, in the 17th year of his reign (1345). Just a year afterwards, on the same day of the month, he fell at the battle of Durham, with a brother of his, whose Christian name is not given. By his wife, a sister of Sir Robert Keith, great marischal of Scotland, who was killed in the same battle, he had three sons, John, William, and Robert. The latter married the heiress of Gight, Aberdeenshire, and was ancestor of the Maitlands of Pitrichie. The eldest son, John, got a safe-conduct to go to England in 1363. He obtained from William, earl of Douglas, upon his own resignation, a charter of the lands of Thirlestane and Tollus, to himself and his son, Robert, by his wife, the Lady Agnes Dunbar, daughter of Patrick, earl of March, and died about 1395. His said son, Sir Robert Maitland, got the charge of the castle of Dunbar, from his uncle, George, earl of March, when that rebellious nobleman withdrew into England, in 1398, in consequence of the contract of marriage between his daughter, Lady Elizabeth Dunbar and David, duke of Rothesay, being cancelled, through the intrigues of Archibald, earl of Douglas, surnamed the Grim. In conjunction with Hotspur and Lord Talbot, the earl soon after returned across the border, and laid waste the lands which, having been forfeited, he could no longer call his own. His nephew, Sir Robert Maitland, having surrendered the castle of Dunbar to the earl of Douglas, escaped being involved in his ruin. He and his family were afterwards designed of Lethington. He died about 1434, leaving three sons. Robert, the eldest, was one of the hostages for James I., on his liberation from England in 1424, when his annual revenue was estimated at 400 merks. As he predeceased his father, without issue, William, the second son, succeeded to the family estates. James, the third son, married Egidia, daughter of James Scrymgeour of Dudhope, constable of Dundee, and from his grandson, John, descended the Maitlands of Eccles and other families of the name. The second but elder surviving son, William Maitland of Lethington and Thirlestane, was the first to change the spelling of his name to its present form. He had a charter from Archibald, duke of Turenne and earl of Douglas, to himself and Margaret Wardlaw, his wife, of the lands of Blythe, Hedderwick, Tollus, and Burncleugh, dated at Linlithgow, 23d March 1432, his father being then alive. His only son, John, died before 1471. His successor, William Maitland of Lethington, was father of William Maitland of Lethington, described as a man of great bravery and resolution, who was killed at Flodden, with his sovereign, James IV., with whom he was in high favour. By his wife, Martha, daughter of George Lord Seton, he had a son, Sir Richard Maitland, the celebrated collector of the early Scottish poetry, after whom the Maitland Club has been called, and a memoir of whom is given afterwards. Sir Richard married Mary, daughter of Sir Thomas Cranstoun of Crosbie, and with four daughters, had three sons, the eldest being William, the personage so well known in the history of the reign of the unfortunate Mary, as “Secretary Lethington.” Sir John, the second son, was lord high chancellor of Scotland and first lord Maitland of Thirlestane. Of both these brothers memoirs are given subsequently. Thomas, Sir Richard’s third son, was prolocutor with George Buchanan, in his treatise De Jure Regni apud Scotos. The daughters, named Helen, Isabella, Mary, and Elizabeth, all married Berwickshire barons. Secretary Lethington was twice married. By his first wife, Janet Monteith, he had no issue. By his second wife, Mary, a daughter of Malcolm Lord Fleming, he had, with a daughter, Mary, the wife of the first earl of Roxburgh, a son, James, who, being a Roman Catholic, went to the continent, and died there, without issue. He sold his estate of Lethington, which had been restored to him by a rehabilitation under the great seal, 19th February 1583-4, to his uncle, Sir John Maitland, who carried on the line of the family. A letter from this James Maitland to the learned Camden, is dated from Brussels in 1620. Sir John, first Lord Maitland of Thirlestane, married Jean, only daughter and heiress of James, lord Fleming, lord high chamberlain of Scotland in the reign of Queen Mary, and by her had a son, John, second Lord Maitland and first earl of Lauderdale (see LAUDERDALE, earl of) and a daughter, Anne, married to Robert, Lord Seton, son of the first earl of Winton. The family of Gibson Maitland of Clifton Hall, Mid Lothian, possesses a baronetcy, first conferred, 30th November, 1818, on the Hon. General Alexander Maitland, fifth son of the sixth earl of Lauderdale. Sir Alexander died 14th February 1820. He had, with two daughters, four sons, viz., Alexander Charles, second baronet, William, a midshipman on board the Portsmouth East Indiaman, drowned in the Bay of Bengal in 1781; Augustus, an officer in the army, mortally wounded at Egmont-op-Zee, 6th October, 1797; and Frederick, of Hollywich, Sussex, a general in the army, a member of the board of general officers, a commissioner of the Royal military college, and colonel of the 58th regiment. General Frederick Maitland was married and left a family. Sir Alexander Charles Maitland, second baronet, born 21st November 1755, married Helen, daughter and heiress of Alexander Gibson Wright, Esq., of Clifton Hall, a scion of the Gibsons of Durie in Fifeshire, and with her obtained that estate, and assumed in consequence the name of Gibson. He had, by her, six sons and five daughters. Alexander Maitland Gibson Maitland, the eldest son, an advocate at the Scottish bar, died in September 1828, leaving, by his wife, Susan, eldest daughter of George Ramsay, Esq. of Barnton, four sons and two daughters. On the death of the second baronet, 7th February 1848, his grandson, Sir Alexander Charles Maitland Gibson Maitland, born in 1820, succeeded as third baronet. He married in 1841, Thomasina Agnes, daughter of James Hunt, Esq. of Pittencrieff, Fifeshire, with issue. The Maitlands of Dundrennan Abbey and Compstone, in the stewartry of Kirkcudbright, and Hermand, in Mid Lothian, are descended from an early branch of the Lauderdale family. Their immediate ancestor was William Maitland, a distinguished Scots ecclesiastic during the latter part of the 17th century, who acquired considerable estates in the stewartry of Kirkcudbright. Thomas Maitland, a lord of session by the judicial title of Lord Dundrennan, born 9th October 1792, passed advocate in 1813, and was solicitor-general for Scotland, under the Whig administration in 1840 and 1841, and again from 1846 till the beginning of 1850, when he was appointed a lord of session. In 1845 he was chosen M.P. for Kircudbrightshire, and died 10th June, 1851. He married, in 1815, Isabella Graham, 4th daughter of James Macdowall, Esq. of Garthland, with issue. His brother, Edward Forbes Maitland, Esq., advocate, was appointed in 1855, and again in 1859, solicitor-general for Scotland. He had previously been depute advocate. Of the name of Maitland there have been many distinguished naval and military officers. Rear-admiral John Maitland, second son of Colonel the Hon. Sir Richard Maitland, third son of the sixth earl of Lauderdale and uncle of Rear-admiral Sir Frederick Lewis Maitland, first saw active service in the West Indies, when he was midshipman on board the Boyne of 98 guns, the flagship of Sir John Jervis, and distinguished himself by his gallantry at Martinique, Guadaloup, &c. He was afterwards lieutenant of the Winchelsea frigate; from which he removed into the Lively, and was in that ship when in 1795 it captured, after an action of three hours, the French ship La Tourterelle. In 1797 he was appointed to the Kingfisher, and on the 1st July succeeded in quelling a mutiny on board his ship, by, with his officers, attacking the mutineers sword in hand, and killing and wounding several of them. This spirited conduct was called “Doctor Maitland’s recipe.” By the earl of St. Vincent, who recommended its adoption to the fleet on similar emergencies. In command of the Boadicea, he saw much service in the Channel, and on board the Barfleur of 98 guns he served with the Mediterranean fleet until the conclusion of the war with France in 1815. In 1821 he attained the rank of rear-admiral, and died in 1836. For a memoir of his cousin, Rear-admiral Sir Frederick Lewis Maitland, to whom the emperor Napoleon surrendered on board the Bellerophon after the battle of Waterloo in 1815, see LAUDERDALE, Earl of. MAITLAND, SIR RICHARD, a distinguished poet, lawyer, and statesman, the collector of the early poetry of Scotland, was the son of William Maitland of Lethington, and Martha, daughter of George, second Lord Seton, as already mentioned. He was born in 1496, and having finished the usual course of academical education at the university of St. Andrews, he went to France to study the law. After his return to Scotland, he recommended himself to the favour of James V., and was employed in various public commissions by that monarch, and afterwards by the regent Arran and Mary of Guise. In March 1551 we find him taking his seat on the bench as an extraordinary lord of session, and soon after he was knighted. He was frequently sent as commissioner to settle matters on the borders, and in 1559 concluded the treaty of Upsettlington, afterwards confirmed by Francis and Mary. As early as October 1560, Sir Richard had the misfortune to lose his sight, but his blindness did not incapacitate him for business. In November 1561 he was admitted an ordinary lord of session, when he took the title of Lord Lethington. Shortly after he was sworn a member of the privy council, and on 20th December 1562 he was nominated lord privy seal. He continued a lord of session during the troublous times of Queen Mary and the regents, in the minority of James VI. His advice to Queen Mary was that of a judicious and faithful counselor, that she must see her laws kept, or else she would get no obedience. (Douglas’ Peerage, vol. ii. P. 67). In 1563 he was appointed one of the commissioners to whom the rights of individuals to the act of oblivion were to be referred, and on 28th December of that year he was one of the committee chosen to frame regulations for the commissaries then about to be established for the discussion of consistorial causes. In 1567 he resigned the office of lord privy seal, in favour of his second son, John, prior of Coldingham, afterwards created Lord Maitland of Thirlestane. On the 1st July 1584, his great age compelled him to resign his seat on the bench, in favour of Sir Lewis Bellenden of Auchnoull, being allowed the privilege of naming his successor. He had been more than seventy years employed in the public service, and the letter from the king to the court of session on occasion of his retirement from the bench, recorded in the Books of Sederunt, states that he “hes dewlie and faithfully servit our grandshir, gud sir, gud dam, muder, and ourself, being oftentimes employit in public charges, quherof he dewtifullie and honestlie acquit himself, and being ane of you ordinar number thir mony yeiris, hes diligentlie with all sincerity and integrity servit therein, and now being of werry greit age, and altho’ in spreit and jugement able anew to serve as appertenis; be the great age, and being unwell, is sa dibilitat that he is not able to make sic continual residens as he wald give, and being movit in conscience that be his absence for laik of number, justice may be retardit and parties frustrate, hes willinglie demittit,” &c. Sir Richard died March 20, 1586, at the advanced age of 90. For his marriage and children see above. With the single exception of a passage in Knox’s History, which imputes to him the having taken bribes to assist Cardinal Bethune to escape from his imprisonment at Seton, but for which it would appear there was no good ground, Sir Richard Maitland is uniformly mentioned by contemporary writers with respect. He collected the “Decisions of the Court of Session from December 15, 1550, to the penult July, 1565,” the manuscript of which is preserved in the Advocates’ Library. His Collections of Early Scottish Poetry, in two volumes, a folio and a quarto, were, with other MSS., presented by the duke of Lauderdale to Samuel Pepys, Esq., secretary of the admiralty to Charles II. And James II., and the founder of the Pepysian Library at Magdalene college, Cambridge, in which they now remain. A selection from these will be found in Pinkerton’s valuable collection of ‘Ancient Scottish Poems,’ published in 1796. Sir Richard’s own Poems were for the first time printed in 1830, in a quarto volume, for the MAITLAND CLUB, which takes its name from him. The best of his poetical pieces are his ‘Satyres,’ ‘The Blind Baron’s Comfort,’ and a ‘Ballat of the Creatioun of the World,’ the latter of which was inserted in Allan Ramsay’s ‘Evergreen.’ Sir Richard’s ‘Cronicle and Historie of the House and Sirname of Seaton unto the moneth of November ane thousand five hundred and fifty aught yeires,’ with a continuation by Alexander, Viscount Kingston, was printed for the Maitland Club in 1829. MAITLAND, WILLIAM, accounted the ablest statesman of his age, historically known as “Secretary Lethington,” eldest son of the preceding, was one of the principal characters of his time in Scotland. He was born about 1525, and after being educated at the college of St. Andrews, he traveled on the Continent, where he studied civil law. In his youth, instead of following the usual pursuits and amusements of young men of his rank, he applied himself to politics, and became early initiated into all the craft and mystery of statesmanship. Though his political career was vacillating and unsteady, his enterprising spirit, great penetration, and subtle genius are mentioned with admiration by contemporary writers of every party. He was one of the first to attend the private preaching of John Knox at Edinburgh, about the end of 1555, when he became a convert to the reformed doctrines. When Knox began to reason against the mass, Erskine of dun invited the Reformer to supper, to resolve some doubts on the subject, “where were assembled,” says Calderwood, (v. i. p. 305) “David Forresse, Mr. Robert Lokhart, John Willocke, and William Matlane of Lethington, younger.’ All their objections against giving up the mass were so fully answered by Knox that Maitland said, “I see perfytely that thir shifts will serve for nothing before God, seing they stand us in so small stead before men.” So the mass, which had been attended by many from custom, and “the eschewing of slander,” was disowned by the Reformed party from that time. On 4th December 1558, during the regency of Mary of Guise, Maitland was, by that princess, appointed secretary of state. The violent proceedings of the queen regent against the Reformers, and fears for his life, from his being known to favour the reformed doctrines, induced him, in October of the following year, to join the lords of the congregation, who had taken possession of Edinburgh. The queen regent and the Romish party withdrew to Leith, but within a month the lords fled to Stirling, and the regent re-entered the capital in triumph. Calderwood says, “William Matlane of Lethington, younger, secretarie to the queen, perceiving himself to be suspected as one that favoured the congregatioun, and to stand in danger of his life if he sould remaine at Leith, because he spaired not to utter his minde in controversies of religioun, conveyed himself out of Leith, a little before Allhallow Eve, and rendered himself to Mr. Kirkaldie, Laird of Grange. He assured the lords there was nothing but craft and falsehood in the queene.” (Hist. of the Kirk of Scotland, vol. i. p. 553.) He was gladly received by the lords, who marked their sense of this his open adhesion to their cause, by sending him to England to lay their position and prospects before Queen Elizabeth, and to crave her aid. She at once sent a fleet to the firth of Forth, to prevent farther assistance being sent from France to the regent, and gave secret instructions to the duke of Norfolk to meet with the Scots commissioners at Berwick, to arrange the conditions on which her assistance was to be given. The commissions appointed by the lords of the congregation to represent them at Berwick on this occasion were, lord James Stewart, afterwards the Regent Moray, Lord Ruthven, the masters of Maxwell and Lindsay, the laird of Pitarrow, Henry Balnaves of Hallhill, and the secretary Maitland. After a great deal of negotiation, a treaty was concluded between Elizabeth and the leaders of the congregation, called the treaty of Berwick, in consequence of which, on the 28th March, an English force under Lord Grey marched into Scotland, and joined the army of the congregation. Maitland acted as speaker of the parliament in August 1560 which abolished the power and supremacy of the Pope in Scotland, Huntly the chancellor having declined to attend. It is well known that when Queen Mary in the following year was about to sail direct from France to Scotland, Elizabeth dispatched a fleet into the Channel, with the avowed purpose of clearing the sea from pirates, but really with the view of intercepting Mary and carrying her prisoner to England. Secretary Maitland and the queen’s brother, Lord James Stewart, are charged with recommending this measure to the English minister. On Mary’s arrival, however, they were chosen her principal advisers, and on 12th November of the same year (1561) Maitland was made an extraordinary lord of session. According to Calderwood (vol. ii. 160), the ratification of the Book of Discipline by the queen met with strong objections from Maitland, who, when it was proposed, sneered, and asked “how many of those who had subscribed it would be subject to it.” It was answered, “All the godly.” “Will the duke?” (Chatelerault), said Maitland. “If he will not,” said Ochiltry, “I wish he were scraped out, not only out of that book, but also out of our number and company; for to what purpose shall travail be taken to set the church in order, if it be not kept, or to what end shall men subscribe, if they never mean to perform?” Maitland answered, “Many subscribed them, in fide parentum, as the bairus are baptized.” “Ye think that stuff proper,” said Knox, “but it is as untrue as unproper. That book was read in public audience; and the heads thereof reasoned upon diverse days, as all that sit here know very well, and yourself cannot deny. No man, therefore, was desired to subscribe that which he understood not.” The ratification, however, was refused. A short time after this Maitland was again sent ambassador to England, and in his absence the nobility blamed him for serving the queen to the prejudice of the commonwealth. On his return therefore he deemed it necessary to strengthen his hands by making friends to himself, and by endeavouring to shake the credit of the earl of Moray at court. In 1563, when Knox appeared before the queen and council to answer a charge of treason, for writing a circular letter to the principal protestant gentlemen, requesting them to meet at Edinburgh, to be present at the trial of two men for a riot at the popish chapel at Holyrood, Mr. Secretary Maitland conducted the prosecution against him. On this occasion he showed himself bitterly hostile to the reformer. When Knox was acquitted by the council, Maitland, who had assured the queen of his condemnation, was enraged at the decision. He brought her majesty, who had retired before the vote, again into the room, and proceeded to call the votes a second time in her presence. This attempt to overawe them incensed the nobility. “What!” said they, “shall the laird of Lethington have power to command us? Shall the presence of a woman cause us offend God? Shall we condemn an innocent man against our conscience, for the pleasure of any creature?” And greatly to the mortification of the queen and the discomfiture of the secretary, they indignantly repeated their former votes, absolving Knox from the charge. At a conference with the leading members of the General Assembly, held in June 1564, a long debate ensued between Maitland and Knox, on those points of the reformed doctrines which gave offence to the court, but chiefly as regards the Reformer’s mode of prayer for the Queen, and on obedience to her authority. In this memorable disputation, although Maitland had the worst of the argument, he is acknowledged to have acquitted himself with all the acuteness and ingenuity of a practiced disputant. An account of this conference will be found at length in Calderwood’s History of the Kirk of Scotland, vol. ii. p. 252-280. In January 1565, Maitland was appointed an ordinary lord of session, and in April the same year he was dispatched to England, to intimate to Elizabeth the intention of Mary to marry the Lord Darnley. 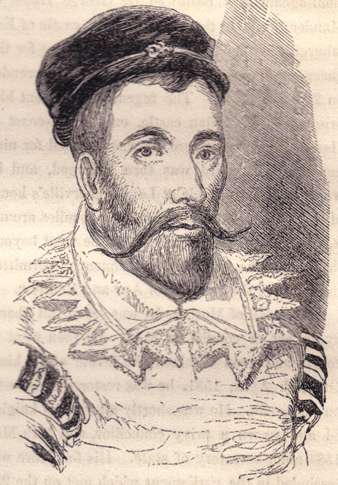 In 1566 he joined the conspiracy against Rizzio, “partly finding himself prejudged by this Savoyard in the affairs of his office as secretary, and partly for the favour he then carried to the earl of Moray, then in exile.” After Rizzio’s murder, he was, for his participation in it, deprived of his office of secretary, and obliged to retire into concealment in Lauderdale, while the other conspirators fled to England, but, before the end of the year, he was restored to favour and allowed to return to court. On the night of Sunday, February 9, 1567, occurred the murder of Darnley, by the blowing up of the house of the Kirk of Field, which had been procured by Maitland for the King’s accommodation, he having been won over by the earl of Bothwell to his designs. With the earl of Morton he solicited and obtained from several lords of Moray’s faction, and from eight bishops a declaration in writing, avowing their belief of Bothwell’s innocence of the murder, and recommending him as a proper husband for the queen. It is alleged that the queen had previously consented to this marriage; but her defenders deny this, and aver that the writings which she was said to have signed was a forgery of the secretary Maitland. He joined the confederacy of the nobles for the removal of Bothwell, and after the surrender of the queen at Carberry Hill, and her imprisonment in the castle of Lochleven, he wrote to her, offering his service, and using as an argument the apologue of the mouse delivering the lion taken in the net. He also proposed that, after providing for the safety of the young prince and the security of the protestant religion, the queen should be re-established in her authority. He, however, attend4ed the coronation of King James VI., on 29th July 1567, and although he was one of the secret advisers of the escape of the queen from Lochleven castle, he yet fought against her on the field of Langside. In September 1568, when the regent Moray was called to the conferences at York, Maitland was one of the nine commissioners chosen to accompany him. The regent, says Spottiswood (Hist. p. 218,) was unwilling to take him, but more afraid to leave him in Scotland. On the other hand, Calderwood says, (vol. ii. p. 429,) Secretary Lethington was very reluctant to go, but he was induced by fair promises of lands and money, “for it was not expedient to leave behind them a factious man, that inclined secretly to the queen.” While in England so great was his duplicity that, we are told, almost every night he had secret communication with Mary’s chief commissioners, and forewarned them of the regent’s intentions. He went out to the fields with the duke of Norfolk, under the pretence of hunting, but in reality to consult with him as to the best means of forwarding the queen’s interests, and he it was who first conceived the fatal project of a marriage between Mary and the duke, as a probable means of restoring her to liberty, if not of replacing her on the throne. He was one of the two commissioners selected by Moray, about the end of October, to proceed to London to Queen Elizabeth, Mr. James Mackgill of Rankeillour being the other, and he was sent with him not so much to assist him as to watch his proceedings. After his return to Scotland, by his secret intrigues he prevailed upon Lord Home, Kirkaldy of Grange, and several of his former associates, to join the queen’s faction, and retired to Perth for a time with his friend the earl of Athol. The regent, suspecting him to be the contriver of all the plots and conspiracies, in favour of Mary, in England and Scotland, sent to him to attend a council at Stirling, and while sitting in council he was arrested, on 3d September 1569, by Captain Thomas Crawford, a retainer of the earl of Lennox, on the charge of being accessory to the murder of the king’s father, Lord Darnley. Security to answer the charge having been offered and refused, he was committed a prisoner to the castle of Stirling, whence he was removed to Edinburgh, and given into the custody of Alexander Hume of North Berwick. Kirkaldy of Grange, governor of the castle, went to Hume’s house at night, and by pretending a warrant from the regent, induced him to deliver Maitland to him, when he was carried to the castle. On the 21st November, the day appointed for Maitland’s trial, a great number of his friends came to Edinburgh, and he not being forthcoming, the regent found himself compelled to postpone his trial. Kirkaldy offered to produce him, if there were any one present to accuse him, and, as none appeared, the secretary’s brother, John, afterwards Lord Maitland of Thirlestane, protested that as there was no prosecutor he was entitled to his liberty. After the murder of the regent Moray in January 1570, the lords assembled to consult upon the affairs of the country, when Maitland had the address to obtain from them a declaration acquitting him of all the charges against him. The Lord Ochiltree desired him to give his oath for their greater satisfaction, which he did. He and Kirkaldy now exerted themselves to effect a compromise between the rival factions, but all their endeavours were unavailing. He was the author of the letter sent by the queen’s lords to Elizabeth, towards the end of March, in behalf of Mary, and among the signatures appears his as “William Matlane, Comptroller.” At this time he was the life and soul of the queen’s party, and there was great resort to him of all who favoured her cause. His house was, therefore, called the school, and himself the schoolmaster, and such as repaired to him his disciples. In his reply, given literally from his deathbed, and verbally, Knox declared that the works of Maitland and those who acted with him testified that they denied there was any God, or heaven or hell, wherein virtue should be rewarded or vice punished. He declined to name his authors, as required by Maitland, and referring to that part of his complaint which affirmed that he was “a man subject to vanity,” and that the words from his mouth should not be received as oracles, &c., he said that the words which he had spoken would be found as true as the oracles which had been uttered by any of the servants of God before; for he had said nothing but that whereof he had a warrant out of the word, namely, that the justice of God should never be satisfied till the blood of the shedders of innocent blood were shed again, or God moved them to unfeigned repentance. He added that Maitland was the chief author of all the troubles raised both in England and Scotland. When Mr. David Lindsay went to the castle, by Knox’s request, to communicate the Reformer’s memorable dying prediction to Kirkaldy, Maitland sent out the sneering message to him, “Go, tell Mr. Knox he is but a dirty prophet.” Lindsay reported this to Knox, who said, “I have been earnest with my God anent the two men. For the one (meaning Kirkaldy) I am sorry that so shall befall him, yet god assureth me that there is mercy for his soul. For the other (meaning Maitland) I have no warrant that ever he shall be weill.” Just a week thereafter, Knox died. At length, the castle being closely besieged by the regent Morton, and an English force under Sir William Drury, marshal of Berwick, surrendered to the latter, after a month’s obstinate resistance, May 29, 1573. Kirkaldy and his brother were hanged at the cross of Edinburgh, but Maitland escaped this ignominious fate by dying in prison in Leith, June 9th, 1573. Calderwood (vol. iii. p. 285) says he “poisoned himself, as was reported,” and Melville (p. 256) “that he died at Leith befor that the rest wer delyuerit to the shamles; some supposing he took a drink, and died as the auld Romans wer wont to do.” He is said to have lain so long unburied that the vermin came from his corpse, creeping out under the door of the house where he was lying. Buchanan it was who portrayed the character of Secretary Lethington in his tract called ‘The Chameleon.’ Bannatyne calls him “the father of traitors,” and designates him “Mitchell Sylie,” a corruption doubtless of Machiavelli. MAITLAND, SIR JOHN, a distinguished statesman, the first Lord Maitland of Thirlestane, second son of Sir Richard Maitland, the poet, and younger brother of the preceding, was born in 1537. After being educated at home by his father, he was sent, as was the custom in those days, to France, where he studied the law. On his return, through the influence of his brother, the secretary, he obtained the abbacy of Kelso in commendam, which he soon exchanged with Francis Stewart, afterwards earl of Bothwell, the queen’s nephew, for the priory of Coldingham. The queen’s ratification of this transaction took place in February 1567. On the 20th April of the same year, he was appointed lord privy seal, on his father’s resignation of that office in his favour, and he was confirmed in it by the regent Moray on the 26th of the following August. On the 2d June 1568, he was constituted one of the spiritual lords of session. Like his brother, Secretary Lethington, the prior of Coldingham ranged himself on the regent’s side, on the dethronement of Queen Mary, but after Moray’s assassination he joined the lords who met on the queen’s behalf at Linlithgow, and thereafter remained steady in his attachment to her cause. He was denounced rebel by the king’s faction in the end of 1570, and forfeited, with his two brothers, in the parliament which met in the Canongate in the following May. He was deprived of the office of lord privy seal, which was given to George Buchanan, while the priory of Coldingham was bestowed on George Home of Manderston. He then retired to the castle of Edinburgh, then held by Kirkaldy of Grange for the queen, and continued with him till its surrender on 29th May 1573. The regent Morton sent him prisoner to Tantallan castle, on the sea-coast of Haddingtonshire, where he was confined for nine months. His ward was then enlarged, and he was allowed to reside at Lord Somerville’s house of Cowthally, with the liberty of two miles around it, under a penalty of £10,000, if he went beyond these bounds. He was subsequently permitted the range of the counties of Ayr and Renfrew. On the fall of Morton, he was set at full liberty by an act of council in 1578. He then went to court, and soon obtained the favour of the king. On 26th April, 1581, he was restored to his seat on the bench. He was shortly afterwards knighted and sworn a privy councilor, and 18th May 1584 made secretary of state. His forfeiture was rescinded in the parliament which met on the 22d of that month, and in the following year, he succeeded, greatly to the satisfaction of the king, in effecting a reconciliation with the exiled nobles, on their return to Scotland. On 31st May 1586 he was appointed vice-chancellor of the kingdom. IN 1587, Sir John Maitland was accused by Captain Stewart, some time earl of Arran, and then chancellor, to whom he had at one time adhered, but had latterly deserted, of being accessory to the execution of Queen Mary and of intending to betray the king into the hands of Elizabeth. Stewart was ordered to enter within the palace of Linlithgow, there to abide the issue of his accusation, but disobeyed the command. He was, in consequence, deprived of the office of lord high chancellor, which was immediately conferred upon Maitland. Two years afterwards, the earls of Huntly, Crawford, and Bothwell, personal enemies of the chancellor, formed a design to march, with their followers, to Holyrood-house, make themselves masters of the king’s person, and put the chancellor to death. On the night in which it was to be carried into effect, however, the king remained in the same house with the chancellor, and thus frustrated their intentions. All their subsequent plots against him were likewise defeated. On the 22d October of the same year (1589) Sir John Maitland, as chancellor, embarked with the king at Leith, on his voyage to Norway, to bring home his bride, the princess Anne of Denmark, who had been driven in there by contrary winds. The royal party spent the ensuing winter at Copenhagen, where Maitland became intimately acquainted with Tycho Brahe, the celebrated Danish astronomer, to whom he addressed several complimentary verses. While in Denmark, he wrote some letters on state affairs to Mr. Robert Bruce at home, to whom had been intrusted the care of the country in the king’s absence. These letters, as well as those of James to the same faithful and energetic minister, were dated from the castle of Cronenburgh, and the last of Maitland’s from Elsinore. He returned with the king and queen on the 1st of May 1590, and on the 17th of the same month, the coronation day of the latter, he was created a peer, by the title of Lord Maitland of Thirlestane. In the procession to the abbey kirk, where the ceremony took place, he carried the queen’s matrimonial crown. The title was granted to him and the heirs male of his body, by letters patent, dated 18th May 1590. The following year he resigned his office of secretary of state, which was conferred on his nephew, Sir Richard Cockburn of Clerkington. IN February 1592 occurred the murder at Donibristle in Fife of the “bonny earl of Moray” by the earl of Huntly. The king and the chancellor were suspected of having been previously aware of Huntly’s intention, and Maitland is said to have “hounded on” that nobleman to the cruel deed. “Camden in his annals,” says Calderwood, (vol. iv. p. 145) “layeth the whole burden upon the chancellor to clear the king; but it is known that these his annals were composed at the king’s direction and pleasure.” So great was the murmuring of the citizens of Edinburgh on the occasion that the king and the chancellor found themselves obliged to go, for a time, to Lord Hamilton’s house of Kinneil in Linlithgowshire, and it was with great difficulty that the provost and magistrates restrained the crafts of the city from taking arms to prevent their departure. The pay of the soldiers of the king’s guard being in arrear, they seized the chancellor’s trunks and coffers, which had been placed on horseback, and did not restore them till a solemn promise was made that they should be duly paid all that was due to them. The keeping of the young prince Henry had been intrusted by the king to the earl of Mar, but as the queen whished to remove him from Mar’s charge, the chancellor, willing to make a friend of her majesty, entered into her plans. This roused the anger of James, who reproved him very sharply for his interference in a matter with which he had nothing to do. Deeply mortified, he retired to Lauder, where, after two months’ illness, he died, October 3d, 1595. He was visited on his deathbed by Andrew Melville and his nephew, Robert Bruce, and had he lived it is thought that the evils with which, soon after, the national church was assailed, would have been averted. The king regretted him much, and composed an epitaph to his memory. Besides a satire ‘Against Slanderis Tongues,’ and ‘An Admonition to the Earl of Mar,’ published by Pinkerton, and described by him as the best state poem which he had ever read, he wrote several Latin epigrams, inserted in the second volume of the ‘Delitiae Poetarum Scotorum.’ The poems attributed to him have been printed with those of his father, Sir Richard Maitland, by the Maitland Club, in a volume issued in 1829. MAITLAND, JOHN, second earl and only duke of Lauderdale. (see LAUDERDALE). The History of London, from its foundation by the Romans, to the year 1739. Also Westminster, Middlesex, Southwark, and other parts within the Bills of Mortality. Illustrated with numerous plates. London, 1739, fol. The same, continued to the year 1760. Lond. 1760, 2 vols. Fol. An edition considerably enlarged and improved, was published in 1765, 2 vols, fol. By Mr. Entick. The History of Edinburgh, from its foundation to the present time; containing a faithful relation of the public transactions of the citizens; accounts of the several Parishes; its Government, Civil, Ecclesiastical, and Military; Incorporations of Trades and Manufactures; courts of Justice; state of Learning; Charitable Foundations, &c.; with the several Accounts of the Parishes of the Canongate, St. Cuthbert, &c.; and the ancient and present state of Leith. In nine books, with plates. Edin. 1753, fol. The History and Antiquities of Scotland. Lond. 1757, 2 vols. Fol. Of the Number of Inhabitants in London. Phil. Trans. Abr. Vii. 257. 1738.